Bailey Balloons0844 3511290work BallooningBailey Balloons offer a personal, friendly service and a memorable hot air balloon flight experience! The experience will last 3-4 hours with about an hour's flight with a glass of chilled Champagne on touch down and a commemorative flight certificate to take away. Wales - so full of promises why not come and fly the Celtic Trail, over the historic archaeological remains of Offa's Dyke, built to mark the boundary to his Kingdom by the powerful King Offa of Mercia in the 8th century. Drift over the ancient castles and take in the panoramic views of the Brecon Beacons and some of the most spectacular scenery in the world. 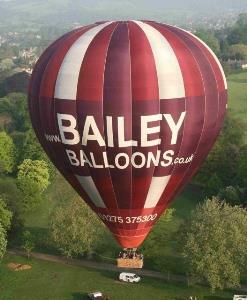 Bailey Balloons offer a personal, friendly service and a memorable hot air balloon flight experience! The experience will last 3-4 hours with about an hour's flight with a glass of chilled Champagne on touch down and a commemorative flight certificate to take away. Special offers available on our Gold Voucher, £130 per person for two or more people. Weekday AM vouchers currently £99 per person and generous group discounts available on request.